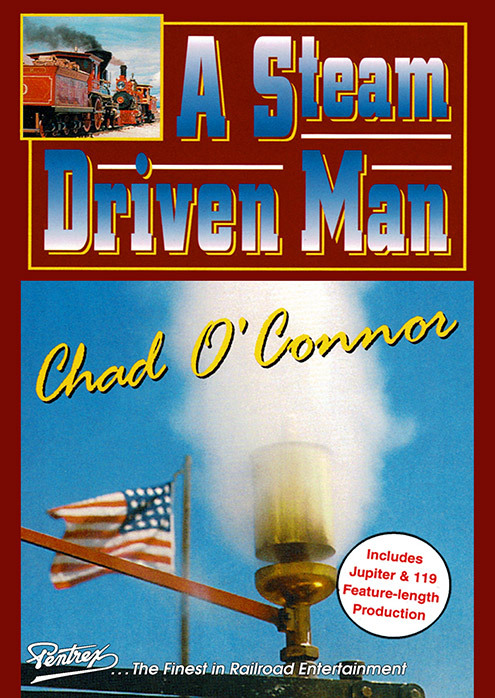 A Steam Driven Man, Chad O�Conner: Chad O�Connor has built or reconstructed his own operating steam boat, tugboat, automobile, truck, and locomotive. He designed steam power plants, rebuilt over a dozen steam locomotives, and constructed replicas of the Jupiter and No. 119 that operate today at the Golden Spike National Historic Site. When he wasn�t working on steam locomotives he loved to film them, as you�ll see in this entertaining tribute to a lifetime of remarkable achievements. You�ll see him at his workshop, and view the Porter, Shay, Climax, Daylight, and other classic steam locomotives he recorded on film. It was his love of filming steam locomotives that brought him, in a roundabout way, the most fame: To keep the film camera steady as he shot the big steam of the time, he invented the Fluid Head for his tripod (winning an Oscar!). It�s a wonderful story for all to enjoy! 38 Minutes, Color, Narration. Jupiter & Number 119, Locomotives of the Golden Spike: This 24 minute show, put together with the help of Chad O�Conner and the Union Pacific Railroad, shows the rebuilding of the famous Jupiter (Central Pacific #60) and Union Pacific #119. This story tells how the engineering documents were made with almost no written data and how the engines are used now. 26 minutes, Color, Narration. Award Value: 99 Points Earn points for free DVDs. Signup free.